The beach known as Playa de las Pulgas (literally, beach of the fleas) at the northern end of the Águilas coastline is a small cove which measures 60 metres in length and is 11 wide. 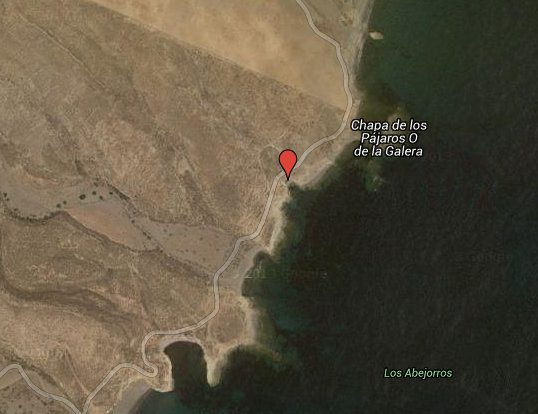 It is located just south of the beautiful beach of Playa de la Galera, and is reached by the same rather complicated route: turn off the RM-D14 at the Bar el Pocico between Cabo Cope and Garrobillo, and take a minor road which initially heads almost due north. After approximately 2 kilometres this road bends back inland, but the beach is reached by taking the track down the slope towards the coast. At the shore the track joins another coastal path – unpaved but suitable for cars - which runs from the Playa de la Galera to the Rambla Elena and provides access to many of the other beaches and coves on this stretch of the Costa Cálida and some of the beaches of Lorca. 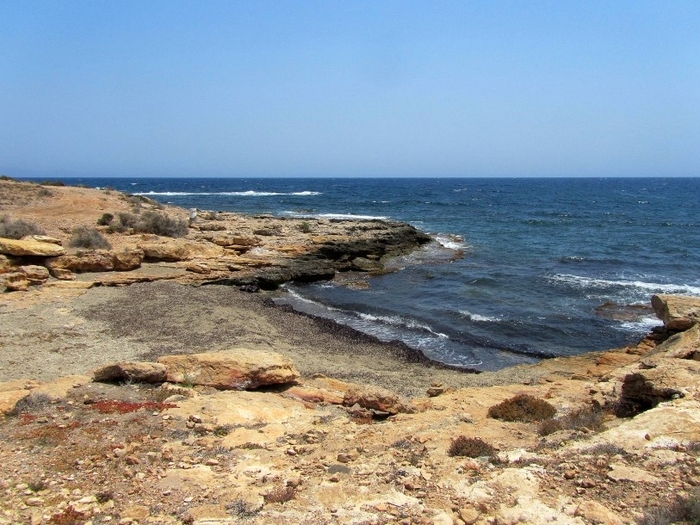 As with the other coves and beaches on this part of the Region of Murcia coastline, there are no facilities or services at Playa de las Pulgas which is hardly surprising given the nature and location of this little cove. Its neighbour La Galera is naturally a clean beach due to the currents which wash against the shore, but here seaweed can accumulate, so it's not the most attactive of the 36 beaches in the municipality. For this reason, occupancy is generally very low as there are much more attractive beaches in the long run along this stretch of coastline. This is the 35th beach in the series of 36 Águilas beaches which run along the 28 kilometres of Águilas coast, working from the Almería coastline in the west down to the Lorca municipality and offer both urban and wild beaches.